Anand Dairy Cooperative (Baroda, India), 1969. 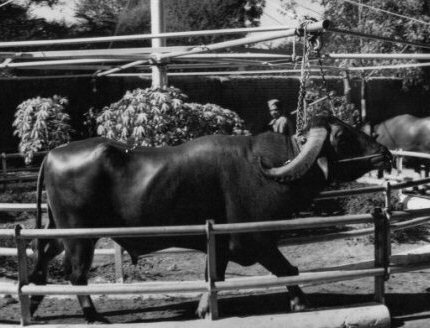 Male buffalo being led to artificial insemination session at Anand Dairy Cooperative near Baroda, India. Photo taken during a trip of E.A.T. team's visit to develop methods of developing instructional television programming for use on the projected ATS-F satellite. In 1969, Vikram Sarabhai of the Nehru Foundation for Development (Delhi, India) and Billy Klüver mobilized a group of telecommunication specialists and called on the artist Robert Whitman to develop an educational television network in rural India. In December of that year, the group travelled to the Anand Dairy Cooperative and set up educational assistance programs for women dairy farmers. E.A.T. and the Nehru Foundation proposed using half-inch video equipment to collect on-site visuals to be shown in educational television shows. In the project's second phase, E.A.T. coordinated the Site Television Satellite, a program to cable broadcast Indian-made television by satellite.